Fox acquisition of the other 61% of Sky may ‘act against the public interest, reducing media plurality’. Yet Sky shares rose when the ruling was published. What is going on? 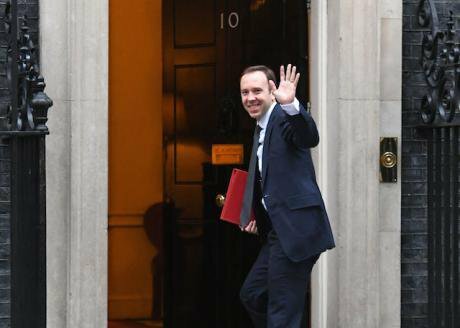 Culture, Media and Sport Secretary Matt Hancock arriving in Downing Street, London, for the first Cabinet meeting following the reshuffle, January 9. Stefan Rousseau/Press Association. All rights reserved.The initial verdict of the Competition and Markets Authority (CMA) on the Fox/Sky deal was delayed by a month, as it was snowed under with submissions arguing that the deal should be blocked, primarily on the grounds that Fox’s many problems in the US showed it was not genuinely committed to high standards in broadcasting. The opportunity to flood the CMA with anti-Fox material was provided by Karen Bradley, then Secretary of State for Culture, Digital, Media and Sport (and recently switched to Northern Ireland). She over-rode the Ofcom conclusion that there was no need to refer the merger to the CMA on broadcasting quality grounds. If that was a gamble – designed to nail down firmly the issue of whether Fox (as controlled by the Murdoch Family Trust, or MFT) was fit and proper to own Sky News – it certainly worked. The CMA endorsed the Ofcom verdict, largely by working through the available material in the same way as Ofcom had done. This was no surprise: it is very rare for one competition authority to squelch another, and the CMA has chosen to remain as close to Ofcom as possible in its approach to the issues. So it was also no surprise that it ruled against the merger on media plurality grounds, thereby backing up an Ofcom judgment that was deficient in all kinds of ways. I set out in a letter to Karen Bradley the crass errors committed by Ofcom, and forwarded a copy to the CMA. That they have slavishly repeated those errors confirms that our regulatory processes are deeply inadequate. Even the most basic and straightforward tests of media plurality – seemingly obligatory in Ofcom’s investigation of the bid, but inexplicably omitted – have again been side-stepped by the CMA. Instead of measuring actual consumption of news and current affairs – which is not that difficult, and for which I demonstrated the methodology in an article for the Journal of Applied Journalism and Media Studies five years ago – the CMA has opted to focus primarily on two metrics selected by Ofcom, despite their being both misleading and unreliable. As I told the CMA in a face to face meeting about the drawbacks of these metrics, we must conclude that the CMA is far more committed to supporting its fellow regulator than in investigating the actual significance of the proposed transaction. We must conclude that the CMA is far more committed to supporting its fellow regulator than in investigating the actual significance of the proposed transaction. The first metric is reach. Reach is notoriously unreliable as a measure of influence. A news outlet can “reach” millions of consumers, but if they only spend a few seconds with that outlet, the impact is insignificant. Ofcom and the CMA were very impressed by the “fact” that one measure of online activity found that 29 million people “read” The Sun online. But such “scores” are extracted from surveys covering as few as 40 respondents. No one knows if those “readers” spent any time at all with the material, let alone any significant time, let alone that anything they might have read constituted news (as opposed to horoscopes, gardening advice, racing tips and crossword puzzles). Certainly, the owners of The Sun (News UK, owned by NewsCorp, itself 39% owned by the MFT, and effectively controlled by the Murdochs) are almost entirely unable to monetize this supposed readership. The measurable daily readership of The Sun newspaper is about 3.8 million people, with the recognized industry readership research organisation estimating that online readership enlarges that by about 10%. In fact, all News UK newspapers combined (The Sun, The Sun on Sunday, The Times and The Sunday Times) account for less than 5% of actual news consumption by UK adults, including their online versions. The BBC accounts for over 60%. For the record, the average UK adult spends less than two minutes a day reading Murdoch newspapers, and watches Sky News (part of Sky plc, owned 39% by Fox, which itself is owned 39% by the MFT) for less than a minute a day. The BBC accounts for over 60% of actual news consumption by UK adults. For the record, the average UK adult spends less than two minutes a day reading Murdoch newspapers. The CMA compounds its erroneous reliance on reach data by claiming that the Daily Mail Group’s “reach” is barely half (17%) the combined reach of News UK and Sky News (31%), which gives it grounds – so it claims – for taking seriously the “threat” to media plurality that might arise from the merger (in solidifying a pre-existing third place, far behind the BBC and ITN, which might in normal circumstances not be seen as grounds for intervention). But the Daily Mail score is a serious underestimate: for reasons never explained, Ofcom (and now the CMA) excluded local and regional news sources from the calculation of significance, as if those sources – which carry national and international news as well as local and regional items – were irrelevant. Perhaps the Ofcom board never reads the Yorkshire Post, or imagines that the Daily Star has much more significance than The Scotsman or the Western Mail. If the Daily Mail Group’s regional newspapers were included (News UK has none – there’s a clue as to why this category was excluded), its reach would be around 30%: Metro alone would add about 8%. The artificial and prejudicial exclusion of regional and local news consumption allows the CMA to repeat Ofcom’s tendentious claim that a combination of News UK and Sky would give the MFT “unique” access to “all four” distribution media: newspapers, television, radio and online. If we – as a full consideration of the matter requires – include local and regional television, radio and newspapers, then we have seven platforms, with the BBC dominating all five in which it is active, a combination of News UK and Sky active on four, and many other news suppliers active on three. Even the “unique access to all four” media conceit is a calculated deception. The benefit to News UK/Sky of the fourth platform – which is not available to the BBC – is trivial: Kantar reported to Ofcom that just 1% of consumers of news relied solely on newspapers (and even there News UK accounts for just 30% of users). It is extremely hard to take such a flimsy and partial analysis seriously, especially when the super-dominant position of the BBC – with a vastly larger share of news consumption than Sky News and News UK combined – is airily dismissed as unimportant, because of its “unique funding structure and governance”. Nowhere does the CMA explain why the licence fee, or the existence of BBC Governors, the BBC Trust or BBC non-executive directors, should make the BBC more likely to observe rules on due accuracy and impartiality. The BBC’s Charter places great emphasis on these values, but in practice the BBC is just as likely as any major commercial broadcaster to face complaints to Ofcom on those grounds. Indeed, successive internal reports have shown that the BBC’s reporting of key issues like the EU and immigration has been biased. Successive internal reports have shown that the BBC’s reporting of key issues like the EU and immigration has been biased. Owners and viewpoints – who, which, what? The second metric favoured by Ofcom and the CMA is the bespoke Kantar Research estimate of “shares of references” in news outlets, which tries to track stories back to their source, so as to establish influence. No other research organisation has undertaken a comparable exercise, so the validity of the findings is at best suggestive rather than conclusive (why the CMA believes it to be preferable to measuring actual consumption remains a mystery: the best that the CMA can offer is that the Kantar study is the “most detailed” piece of research available in terms of establishing a “common currency” of consumption – but that is demonstrably untrue). The main thrust of this particular Kantar exercise is actually unhelpful to the CMA case: it shows, in particular, that far from the BBC being reliant on newspapers for stories, newspapers source more stories from the BBC than the BBC sources from them. The CMA claims that this research shows that Sky News and News UK together “represent at least 10% of total news consumption” – but fails to explain how News UK’s 3% and Sky News’ 6% as per Kantar add up to 10% (let alone the “as much as 14%” that the CMA, following Ofcom again, imagine the total might be). All of this so-called analysis is anyway based on a fundamental mis-reading of the relevant legislation. The CMA – following on, again, from Ofcom – constantly refers to “viewpoints” in television and radio news. The legislation is quite clear: the requirement in newspapers is for there to be a sufficiency of viewpoints available to consumers in all parts of the UK, but with media enterprises engaged in broadcasting the requirement is for a sufficiency of owners, not “viewpoints”. The reason for this differentiation is that Ofcom-licensed broadcasters are not allowed to offer their own “viewpoints” in news and current affairs programmes: they must abide by the Broadcasting Code, which imposes a duty of due accuracy and impartiality. The freedom enjoyed by newspapers to express political opinions is explicitly denied to broadcasters. It follows that the entire line of reasoning in the CMA report is based on a false assumption: that Sky News has a current “viewpoint”, and that if the MFN – through its control of Fox – gained control of Sky News, it might “align” that “viewpoint” with those of one or more of the newspapers published by News UK (which is owned by NewsCorp, not by Fox, but in which the MFN also has a controlling interest). Oddly enough, the CMA’s lurid imaginings do not run as far as worrying about “alignment” of Sky News with The Wall Street Journal or any of the dozens of local freesheets published by NewsCorp, such as those in Long Island or upstate Queensland. The first test of this false premise is easy: please, CMA, tell us what the current “viewpoint” of Sky News is. There will, of course, be no answer to this: if the CMA could detect such a “viewpoint”, it would be obliged to report Sky News to Ofcom for breaching the Broadcasting Code, which forbids “viewpoints”. Like Ofcom, the CMA has tried to wriggle round this difficulty by claiming that different broadcasters have different news agendas and different editorial lines: but that is a banal observation and certainly does not mean they therefore have “viewpoints”, let alone identifiable ones. Clearly, there is no single news agenda that every single broadcaster follows, delivering stories in precisely the same order, length and fashion. Editors decide what events or subjects are of most importance in allocating their scarce resources and airtime, and even the designated public service news programmes offer very different running orders without in any way breaching Broadcasting Code requirements – these running orders do not constitute “viewpoints”, otherwise Ofcom would be required to intervene. The CMA posits a situation where a story in The Sun might – after the transaction – be “more influential” by also being carried by Sky News. But if it were broadcast by the BBC, would it be similarly “more influential”? – and would such a broadcast be indicative of “alignment” between News UK and the BBC? Of course not. Indeed, currently the Sunday Times and Channel 4 are working on an investigative feature involving former ministers allegedly taking paid advisory jobs for foreign interests. Would that constitute Channel 4 making a Sunday Times story “more influential” (or vice versa)? Or be evidence of “alignment”? Currently the Sunday Times and Channel 4 are working on an investigative feature involving former ministers allegedly taking paid advisory jobs for foreign interests. Would that … be evidence of “alignment”? This crass and ignorant approach to the way journalism works is simply embarrassing. It also ignores the fact that the Murdoch newspapers encompass a wide array of opinions, often deliberately clashing. Can the CMA identify the stories in the four UK Murdoch newspapers which exemplify the Murdoch “viewpoint”? Just as Ofcom foolishly speculated on whether a Fox-owned Sky News might use News UK journalists to push unidentifiable MFN “viewpoints”, so the CMA report wonders whether the transaction would allow the MFT to induce Sky News to “push certain stories and downplay others”. But this is entirely speculative. If the news agenda at Sky News were to change – now or in the future – how would we know? What difference would it make? Would that change be compliant with the Broadcasting Code? If not, presumably Ofcom could intervene. If it was code-compliant, what would be the problem? Over the 30 years that Sky News has been on air, during which time the MFT-controlled NewsCorp has had 100% ownership for some years, and 50% ownership for other years, can the CMA point to any examples of attempted influence on the news agenda for Sky News? The clear implication of the CMA approach is that, if that news agenda were to change, in a measurable fashion, even if such change were perfectly legal and code-compliant, it would be contrary to the public interest if it happened under Fox control – even if it were impossible to demonstrate any “alignment” with News UK “viewpoints” (whatever they might be) – but not if it happened under anyone else’s control. Despite the glaring weaknesses in its argument, the CMA nonetheless concludes that the proposed transaction “may be expected to result in an insufficient plurality of persons with control of media enterprises”. Yet nowhere does the CMA attempt to define what a “sufficient plurality” would be. If there were 100 such enterprises, and a merger reduced that number to 99, would that result in “an insufficient plurality”? When Northern and Shell bought Channel 5, or when News UK bought The Wireless Group, in both cases resulting in a measurable reduction in the “plurality of persons with control of media enterprises”, was there any intervention? Did either acquisition result in “an insufficient plurality”. This is a verdict with no attempt at an argument. The CMA compounds its errors by postulating that it is unlikely that any other cross-platform news provider could emerge if this transaction were allowed. Yet Trinity Mirror is currently planning to buy Northern and Shell, the publishers of Express Newspapers (presumably thereby radically re-positioning their editorial stance, but nobody seems concerned about that); Trinity Mirror has a major position in local newspapers, and has previously owned a TV channel; Northern and Shell previously owned Channel 5; and there is nothing to stop the enlarged group buying one of the major commercial radio operations – so a cross-platform provider almost as large as News UK and Sky News combined is certainly imaginable (other than by the CMA). Trinity Mirror is currently planning to buy Northern and Shell, the publishers of Express Newspapers (presumably thereby radically re-positioning their editorial stance, but nobody seems concerned about that). To give credit where it is due, the CMA report does provide an exhaustive set of possible remedies which might persuade it to advise the Secretary of State (now Matt Hancock) to approve the Fox/Sky merger. Indeed, it was the range of options listed, and the assumption that somewhere along the line the CMA and Fox could strike a deal, that presumably triggered the 25p jump in the Sky share price the day the report was published. The remedies paper starts, however, with the option of straight prohibition of the deal as “a comprehensive solution” to the imagined problem, and one posing “relatively few risks”. This is a particularly daft assessment. The majority shareholders of Sky have already made clear that, if closing Sky News would remove an obstacle to the planned transaction, they were willing to do that. As even the CMA recognizes that such closure would be the worst possible outcome in terms of media plurality, it is hard to understand why such an explicit warning, in writing to Ofcom, should be ignored. The CMA correctly notes that such a closure is not permitted in the midst of the regulatory process (which is why it has not yet happened), and opines that the continued supply of Sky News should not be an inhibition to the current Disney bid to buy most of Fox (including its holding in Sky, whether 39% or 100%) – indeed, the CMA says that ownership of Sky News by Disney would allow its media plurality concerns to “fall away”. But this lazy logic misses the point. Fox cannot know for certain that the Disney bid will pass regulatory muster in the US. If the current Fox bid for Sky were blocked, the obvious course of action would be for Sky News to be closed immediately, and a renewed bid for Sky then to be launched (as soon as the Takeover Panel rules allow), this time with no risk of regulatory intervention. Indeed, given the length of time the current process is likely to take, Fox might be better advised to abandon the bid now, allow the majority shareholders in Sky to close Sky News, and then re-instate the bid, with a predictable timetable, unaffected by politicians or regulators. Fox might be better advised to abandon the bid now, allow the majority shareholders in Sky to close Sky News, and then re-instate the bid, with a predictable timetable. Paradoxically, there would be nothing to stop Sky News being re-launched after Fox completed the purchase of Sky: the only time the regulatory machinery can be invoked is in the course of a transaction. Indeed, one of the advantages of this course of action would be that all the remedies considered in the CMA paper could be ignored in the context of a re-launch. These remedies fall into two categories: structural and behavioural. A structural remedy removes Sky News from the Sky business, either by a sale or by a spin-off process. It was just such a remedy that Ofcom negotiated with the Murdochs in 2011 in order to push through their previous bid for Sky (which they then abandoned in the aftermath of the Milly Dowler revelations). However, Ofcom has now recognized (as I argued in 2011) that, not only is there little prospect of an actual sale of a loss-making news channel, but that operational independence is too risky in the medium to long term. That is why it recommended a behavioural remedy (ring-fencing the editorial independence of Sky News within a Fox-owned Sky) in its report last year on the transaction. Karen Bradley rejected as inadequate the tentative formula suggested by Ofcom, presumably on the assumption that a CMA process would induce Fox to offer greater guarantees of independence (for instance, by eliminating all Fox representatives from the proposed Sky News editorial board, and offering longer-term financial commitments). The CMA paper canvasses some options, but also manages to undercut them – perhaps inadvertently – by noting two issues that will not be resolved by any remedy. The first is that Sky will still remain by far the largest customer for Sky News. Even if the budget for the news service were guaranteed, along with its EPG slot, room would remain for Fox to put pressure on Sky News editorially (in the world of the fevered imagination of the CMA, where the MFT is still trying to “align” Sky News editorially with one or more of the newspapers it controls). That pressure might be subtle: failure to promote the channel, or distribute it internationally, or sell its airtime in a way that gives confidence of a continuing existence. The CMA even floats the notion, in its report, of “members of the Murdoch family” going “directly to editorial staff” to give “clear expression” of their views – which, of course, would by-pass all the elaborate firewalls discussed in the remedies paper as a means of preserving editorial independence. One notion floated is that Fox might sell Sky News directly to Disney now, in advance of completing the rest of the Disney transaction. At one level, this might remove concerns about Fox involvement in the channel. But as Disney has no interest in Sky News as such, it is hard to see why it would engage in the kind of fail-safe discussions with Fox that would be needed to guard against the possibility of the full Disney bid being blocked or dropped before the end of 2019. More ominously, the CMA also notes that the Disney deal would leave Fox as the second largest shareholder in Disney (even at the 5% level), with a possibility of a Murdoch joining the Disney board. It would seem that the Disney transaction does not allow all the CMA concerns to fall away. Indeed, if I were Bob Iger – Disney’s CEO – reading this report, I would urge the Murdochs to shut the channel down now, to avoid any danger of his bid for Fox being sucked into the UK’s regulatory grasp: there are enough problems in the US. Of course, if the Murdochs had had any sense, they would have closed Sky News before launching the current bid. They were ill-advised in imagining that the split that they executed five years ago, between NewsCorp (owning the UK newspaper company) and Fox (owning the entertainment assets, including the Sky shareholding), would eliminate the political resistance that bogged down the last bid. This bid still has months of hassle ahead of it: the current CMA consultation period, the final CMA report (which may not be delivered by the promised May 1st deadline), then a period for the Secretary of State to reflect, with a possible further consultation on a potential remedy, and then further iterations of that process. The opponents of the bid have nothing to lose in dragging the process out indefinitely. Fox has said it will continue to engage with the CMA: but it is easy to see why abandoning the bid has its attractions, especially as any remedy agreed with the Secretary of State to get the deal done would remain a political bone for Murdoch’s enemies to gnaw on for years to come, whereas closing and then re-launching Sky News would eliminate all of that headache. Ominously, asked the direct question at this week’s announcement of Sky’s (excellent) results, CEO Jeremy Darroch explicitly acknowledged that Sky News was less important in brand terms now than when Sky launched 30 years ago. Fox has already announced it will pay a special dividend to non-Fox Sky shareholders as the penalty for failing to close the transaction in 2017. Another penalty for abandoning the bid would be a small price to pay for eliminating a hostile regulatory and political process, buying all of Sky without having to make any regulatory concessions, and smoothing the way to the planned Disney deal, by not re-launching Sky News till after that deal is completed. In theory, Disney should be quite relaxed about dealing with the UK’s Mickey Mouse regulators: but if you can avoid the hassle altogether, why not?